Fifty years ago, Robert Francis Kennedy was gunned down. Students of history are aware of the historical context, but I prefer focusing on what I call the education of Robert Kennedy and the implications of his death. The 1968 Kennedy was far different than the one who worked with Senator Joseph McCarthy during the red-under-every-bed McCarthyism Era. Nor was he the thirty-six-year-old who stepped up to be his brother’s attorney general. Kennedy was born of privilege, not wanting for anything. His wealth, gender, and race opened doors readily and widely for him. He lived, though, in the shadow of his war-hero older brothers, Joe and Jack. To compensate, perhaps, for his diminutive physical size, Bobby evolved into a scrapper. The runt of the Kennedy clan, the Robert Kennedy of 1968 had been transformed from a defensive, aggressive political boxer into a compassionate, liberal icon who came to realize the folly of the War in Vietnam as well as how racial oppression and economic poverty were not only inimical to the American Ideal but, if not addressed and rectified, would inevitably lead to the collapse of the American Experiment. History is bearing him out. Kennedy was a strategic genius. So, when John decided to take on the political establishment, brother Bobby was perfect to lead his campaign. Bobby got John elected Senator from Massachusetts in 1952 and eight years later President of the United States, ushering in the Camelot Ear that died horrifically on November 22, 1963. Picking up the Kennedy mantle from his slain brother, he got elected in his own right as Senator from New York in 1964. He witnessed and took part in great historical events and movements: the Cuban Missile Crisis, escalating American involvement in Vietnam, Civil Rights Movement, and increasing awareness of poverty in both urban and rural America, particularly Appalachia. Television brought the stark reality of those into Americans’ living rooms where they could witness firsthand the horror of Vietnam and their fellow Americans’ dire living conditions, the fire-and-bloodletting scenes diffused only by being grayed out in black-and-white. By the time Kennedy ran for president, they were broadcast in living-and-dying color. Kennedy’s conscious took on a higher awareness, changing him into something other and greater. His evolving consciousness reflected that which was happening to the collective American conscious and consciousness. However, reactionary forces responded leading to the crumbling of the American Experiment to where we are today, a society afraid of the other, a dystopian culture dominated by an obscenely wealthy oligarchy buttressed by a minority that operates from fear and anger. 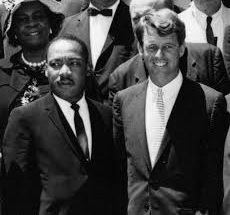 A telling moment in Robert Kennedy’s life occurred on April 4, 1968, the night Martin Luther King was assassinated. Against wife Ethel’s and his advisor’s strong counsels, he addressed a predominantly African American crowd in Indianapolis. Two months later, we had an answer. As American democracy and the pursuit of social and economic justice falter, teetering on collapse, one wonders if a 21st-century Robert Kennedy awaits, ready to make his/her entrance.